Our Mini Flypacks are equipped with this half-rack size HD digital video switcher. In spite of its compact size the HS50 switcher features four SDI inputs, one DVI-D input, two SDI outputs, and one DVI-D output. 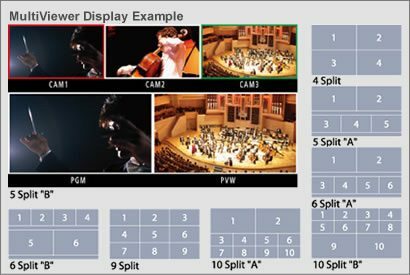 A MultiViewer Display function lets you split the screen in eight different ways, and a Frame Synchronizer ensures easy, high-quality switching. The Panasonic AW HS50 HD Switchers are perfect for multi-camera and multi-format source shoots. The AW-HS50 supports a variety of HD/SD formats, including 1080/24PsF, as standard. • Five inputs : Four SDI inputs and one DVI-D input come standard. • Three outputs : Two SDI outputs and one DVI-D output come standard. A Frame Synchronizer is embedded in all inputs. This enables asynchronous video signals to be switched without glitches. The AW-HS50 is equipped with an SD/HD up-converter function for two inputs (SDI IN 3/SDI IN 4), and a dot by dot function that can be used for P-in-P display of HD images from SD footage without degradation. A video processing function with brightness, pedestal level, saturation, and color phase correction is also provided for four inputs. • Transitions : 13 wipe patterns and mixes. • The built-in key function lets you select from linear, luminance and chroma keying. • One P-in-P bus and one Aux bus are included. A Bus transition function (P-in-P bus and Aux bus switching effect) enables Mix transitions. Five crosspoint buttons in each A bus and B bus (for a maximum of 10 with the Shift function), a Cut button, a P-in-P button, a Key button and an FTB button allow direct control with this simple panel layout. It’s really easy to set up your shots and pick your transitions quickly and easily and save them. 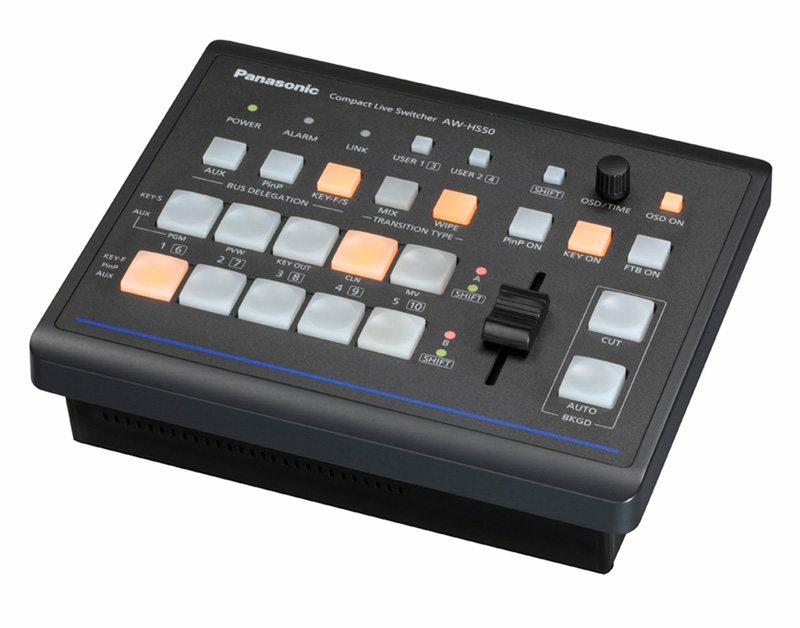 This switcher makes three camera shoots on a tight budget and short notice a breeze. The built-in MultiViewer Display function can simultaneously display various images, including program (PGM), preview (PVW) and input signals, on a single monitor. The screen may be split into 4, 5a/5b, 6a/6b, 9 and 10a/10b sections.